We live, it many respects, in increasingly polarised times. Existing faultlines - both in society at large and within religious communities - between liberal and conservative, traditional and progressive - appear to be widening exponentially. We are quicker to take offence, it often seems, than in days gone by. Building bridges between people of differing political opinions certainly feels more difficult than it used to. It is all too easy, under the influence of social media, to demonise those we do not agree with, while never meeting them face to face and never engaging with the human reality behind the screen. When my wife and I founded the South Manchester Julian Prayer Group in October 2013 we had precisely this conflict in mind. 'Only Connect' was our key phrase. How, we asked ourselves, can we reach across the fissures, bring peace to the contemporary 'culture wars' (individually and collectively) and arrive at a place of silent equanimity, a point beyond argument, disputation and dogmatic assertion, a base from which we might move forward into the world - not to fight, kick and bite - but with genine confidence, trust and love? The Julian Meetings began in 1973. 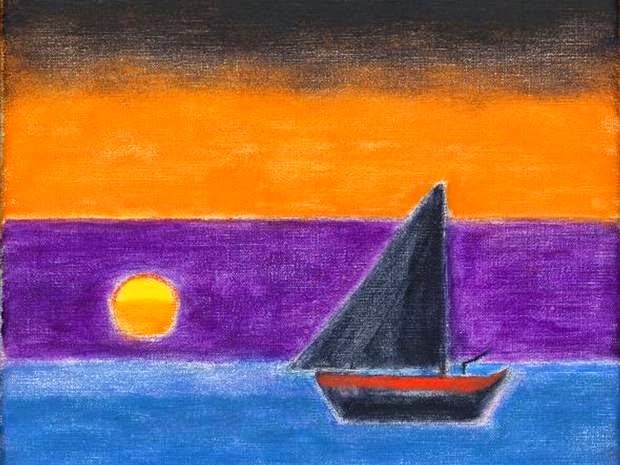 They are an ecumenical exploration of shared, contemplative silence in the tradition of the Christian mystics. A short reading, in the South Manchester group, (either an extract from scripture or a piece of poetry or prose), leads us into thirty minutes of communal silence. A similar reading, followed by a short spoken prayer, concludes the meeting, ushering us back into the world with clarity of mind and a sharpened sense of vision and purpose. 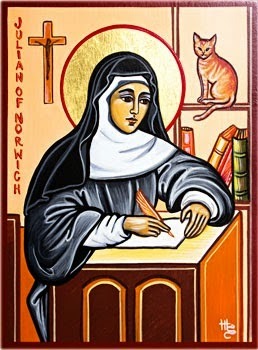 The Julian Meetings take their name from Julian of Norwich, who was born in 1342 and died around 1420. On 8th May 1873, during severe illness, Julian received a series of sixteen visons of Christ, which she referred to as 'showings' in her subsequent book. After her recovery, she became an anchoress, a woman devoted entirely to the religious life, living permanently in a cell attached to a church in the heart of Norwich. Julian meditated, for twenty years, on the visions she had received, and began to give a written account of her experience in the first book known to be written by a woman in English, The Revelations of Divine Love. All this time, from the window of her cell, she had been giving daily counsel and comfort to the burdened and distressed of the city. The Julian Meetings are by no means a cult of Julian of Norwich. We do not offer prayers or devotions to her, but we do attempt, as best we can, in our shared, silent prayer, to engage with the spirit she reveals to us in her life and writings. We see in Julian's story a dedicated life of contemplation blended with profound compassion and understanding of the people of Norwich who passed by her window every day. This mingling of the spiritual and the earthly encourages us in our responsibility to be 'in the world, but not of it.' The silence we share in the Julian Meetings becomes our 'bright field,' 'lit bush' and our 'pearl of great price.' We bring it back, like lantern bearers, to our conflict-ridden world. All of us, whatever our political persuasion, cultural stance, or dogmatic position can share in this silence. No prior qualifications are required. All of us can reach the same 'still point'. We sit in our circle, with Christ as our magnetic north (as He was for Julian), and take a first, tentative step in reaching out and touching what is real and essential in ourselves and each other, beyond argument and beyond disputation. It is a voyage to a beginning. From there, we can venture out into the world with no need to prove ourselves right or win all the arguments all the time. Anxiety's hold is weakened. Peace - a hard-won peace and therefore true - begins to build in our hearts. "It is not enough merely to look out for one's soul and believe that Truth - the Truth which in a particular place and time took on human form and walked among people and assumed their suffering - is no more than a position which needs to be maintained. If the chief form of the present political evil is a restrictive heaviness that all citizens carry on their shoulders and at the same time within them, then the only possibility is to shake that evil off, escape its power, and to seek truth. Under such circumstances, every genuine struggle for one's soul becomes an openly political act, and a creative act that, because it is no longer merely 'defining oneself' against something else, but rather a jettisoning of ballast and opening oneself up to what is new and unknown, Christians can and should become one of the means by which this potential is revealed and made manifest." Please contact me via Twitter or the comments section below if you are interested in attending the South Manchester Group. I was very pleased to find this. I now run Facebook and Twitter accounts for the Julian Meetings nationally, and have posted links to this blog entry. Ann Moran, who oversees the national JM website, would like either to post a link to this, or copy it, on the website and in the associated web forum. Would you have any objection?